I will confess I am new to Cath Kidston products although I have heard of the brand I have never owned any products from the designer. 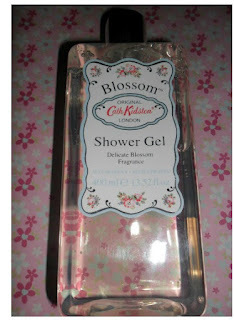 As you will see in my previous post I was given the Blossom shower gel as a birthday present so today I decided to try it out. Cath Kidston is a British fashion designer her company sells a range of home furnishings etc though shops, online or though mail order. She is well know for her floral patterns and has also published a number of books. Personally what I care about in the shower gels is a light scent and something that keeps my skin soft and smelling nice all day long and by the sounds of it this ticks all the boxes. I was very impressed with the packaging of this item the blue and silver with a hint of floral design on the box and also on the product bottle certainly gave it an elegant look that is certainly more up market then what I normally buy. I also love that it has a vintage feel, the click button to open it is also a bonus meaning that there will be no wastage like I normally have with majority of shower gels. I love it, it lathers up really well and only need a tiny bit so it will last me ages and the floral scent means that I wont have to worry bout putting any perfume on. I love how the blossom is scent isn't too over powering either. I definitely want to buy this when I run out.